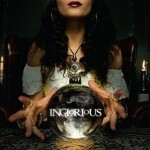 Share the post "Album review: INGLORIOUS – Inglorious"
Inglorious formed in February 2014 and they are fronted by Nathan James, who has sung live with Trans-Siberian Orchestra and Uli Jon Roth, along with TV’s ‘Superstar’. The line-up is completed by guitarists Andreas Eriksson and Will Tyalor, bassist Colin Parkinson and drummer Phil Beaver. The album is produced by the legendary Chris Kimsey of the Who and Rolling Stones fame and the band have a few outside writers including Al Pitrelli (TSO/Savatage) and Joel Hoekstra (Whitesnake/Night Ranger). They have been building up a profile nicely with a couple of showcase gigs, including Planet Rockstock and early next year they support the Winery Dogs on their European dates and then play a handful of headlining UK dates of their own. The band wear their love of 70′s rock on their sleeves and the opening song, ‘Until I Die’, starts with a Jon Lord-approved rumbling Hammond riff. That’s not to say they are mere copycats, as they have a lot of their own musical ideas and the band’s biggest pulling power are the vocals of Nathan James. What a voice this man has! I have not been this impressed by a new vocal talent for many years. Check out the heartfelt vocal delivery on ‘Bleed For You’. The acoustic guitar and slow guitar riff draw you into a vocal tour de force, even shades of Axl Rose at times. It is hard to pick out highlights on such a strong album, however ‘High Flying Gypsy’ is a top notch hard rock song. Neat guitar interplay between Andreas Eriksson and Will Taylor and a big, fat chorus made for radio and live arenas. Bad Company came to mind on ‘Holy Water’ (not a cover of that band’s song though), another glorious hard rock tune and a rhythm section that play a tight groove throughout the album. The title track rocks like a good ‘un – they have an uncanny knack of penning killer guitar riffs. Interesting song as they use vocal effects, almost Queen-like and another monster chorus. Also Nathan James unleashes vocal screams that even the Metal God himself Rob Halford would approve of. They can tone it down a little though as the beautiful acoustic refrains of ‘Wake’ show. This entry was posted in ALBUM REVIEWS, ALBUM REVIEWS (Mobile), All Posts and tagged album, hard rock, Inglorious, Nathan James, review, rock. Bookmark the permalink.